If using Gmail, be sure to click "View Entire Message" so you won't miss any info! presented Springboard Enterprises on March 22, 2018. 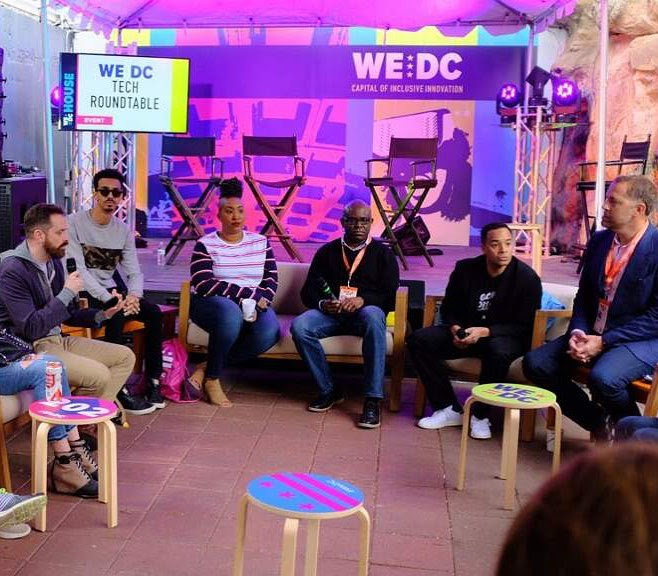 BEACON Board Member and Founder of Black Girl Ventures, Shelly Bell, joins local ecosystem leaders and Deputy Mayor Brian Kenner for a conversation on diversity and inclusion in D.C.'s tech scene at SXSW. 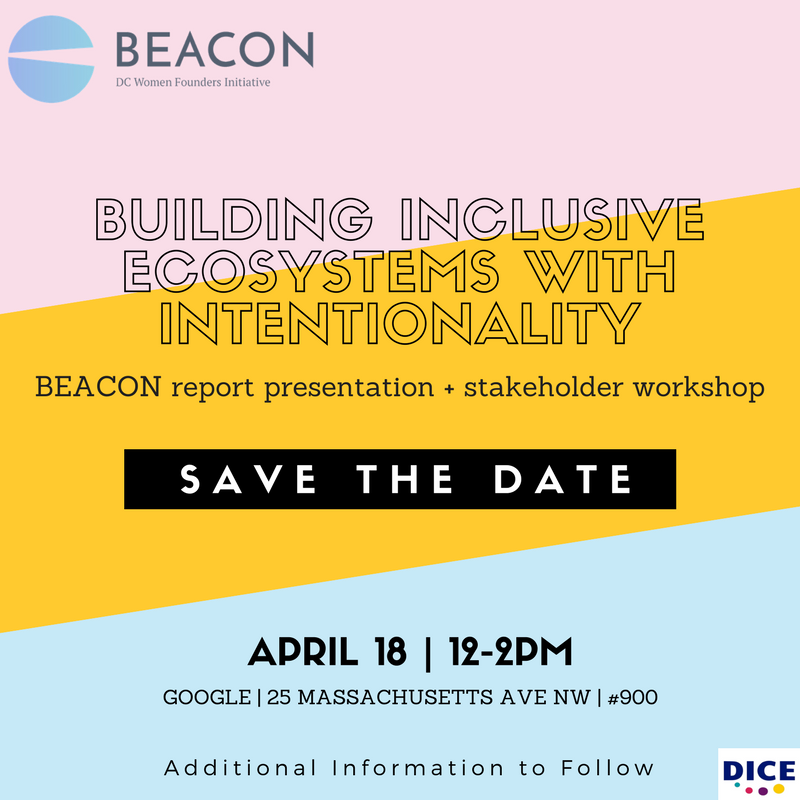 BEACON grantee, Springboard Enterprises, hosted the "BEACON Dolphin Tank" on March 22nd at the Alley. As a "helpful, feedback-driven" pitch session, the "Dolphin Tank" model allows for entrepreneurs to receive constructive insights from knowledgeable experts. Rather than compete for the best idea, hosts channel the expertise of the people in the room with a goal of providing connections and advice to enable entrepreneurs to overcome challenges and capitalize on opportunities. Bonnti is a mobile platform that helps you navigate and simplify your hair experience. We understand your hair is unique and we want to empower women to have more choice when it comes to their hair. Dressmate is a platform that allows college women to rent-out clothing to one another. Founded in 2016, Dressmate was born out of the belief that women deserve affordable, high-quality clothing. Well-Kept Beauty is a mobile app that helps ingredient-conscious consumers manage their skin health by tracking and monitoring cosmetic ingredients and expiration for safe and suitable choices. Makeup America! is a new American-branded, patriotic-themed beauty company with a unique social purpose: to economically empower women to pay down the U.S. national debt. Black Girl Ventures, founded by BEACON Board Member Shelly Bell, also hosted a "Boss Up!" pitch competition in March. Boss Up! flips the traditional pitch competition by empowering the community (audience) to contribute to the "vision fund" and vote for their favorite pitch! Congratulations to Kristin Henderson of BLK + GRN for winning the spring competition. Kudos to all competitors for participating and showcasing their innovative ventures! Jazmine Kionna, LLC is a brand of high-heeled shoes that feature built-in shock absorbent gel and memory foam insoles. Freshpire redirects fresh food from local landfills by partnering with local food distributors, restaurants, and businesses to create a network and community of zero food waste. NEXUS is a full-service dissertation agency dedicated to helping you get #FromStartToPhinisheD in one year or less. Test4Me empowers teachers to create adaptive tests for grades K-12. Femly is a disruptive tech-based menstrual hygiene company that aims to provide alternatives to toxic menstrual care products through a monthly subscription service and all-natural products. EnrichHER unites founders and funders who share a vision for sustainable women-led ventures. 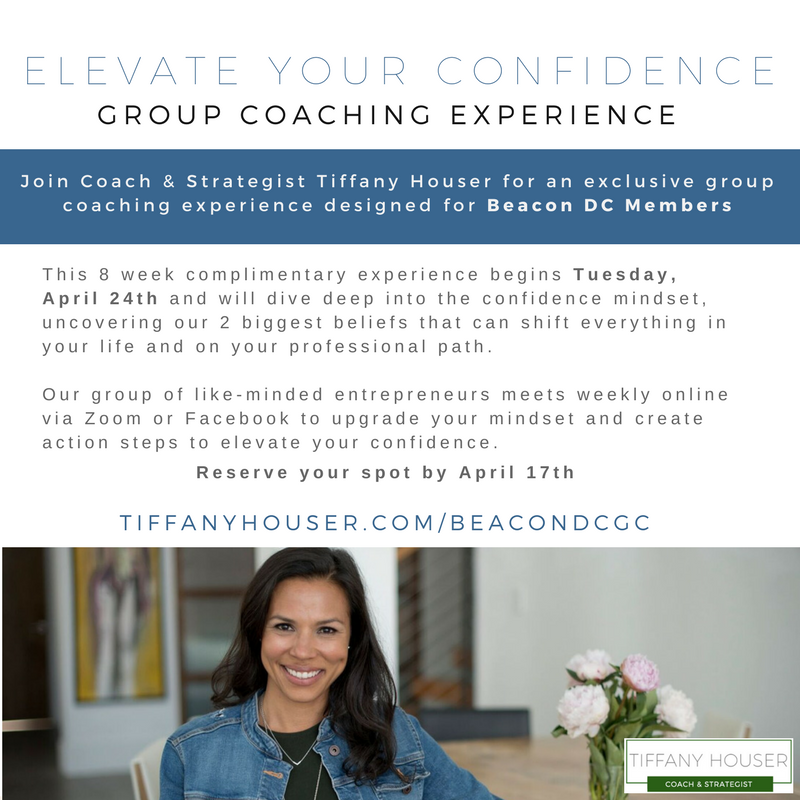 BEACON is thrilled to partner with coach and strategist Tiffany Houser for an exclusive + FREE group coaching experience designed for BEACON community members. 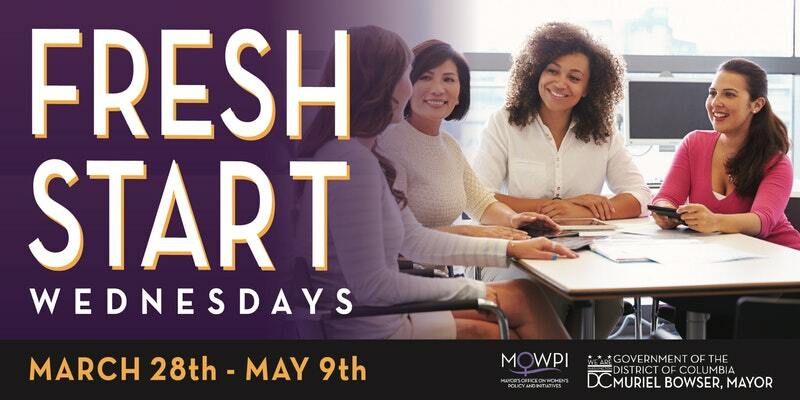 This 8-week complimentary experience begins Tuesday, April 24th and will dive deep into the confidence mindset, uncovering the two biggest beliefs that can shift everything in your life and your professional path. Click here to learn more and sign-up today! 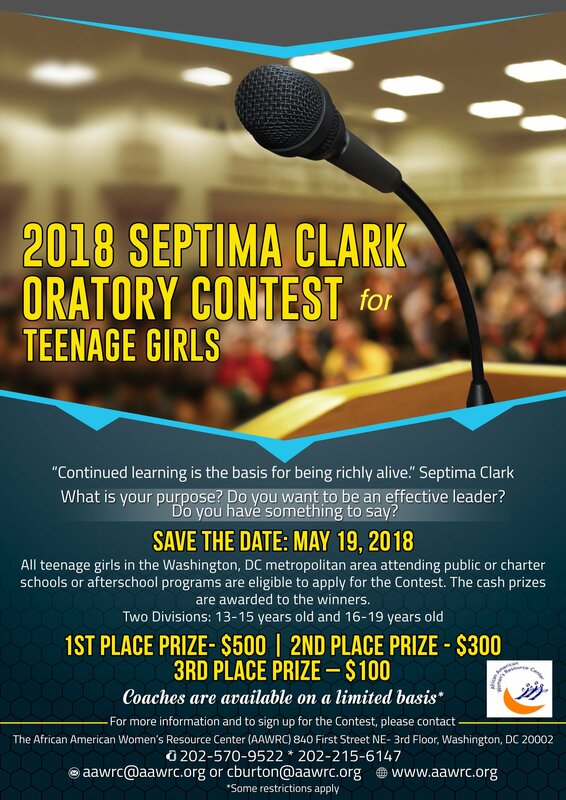 Are you interested in participating in the D.C. Women's Business Center Pitch Competition on April 11th? Prizes range from $250 $1,000. Send an email request to ebeauchamp@dcwbc.org or call Liz at 202-393-8307. The Ward 7 and 8 Microbusiness Dream Grant Program will support the growth of businesses with fewer than five (5) employees located in Ward 7 or 8, for which residents of those wards comprise 50% or more of the ownership of the businesses. Grants ranging from $10,000 to $50,000 each will be awarded in Spring 2018. Learn more and submit by 2pm on 4/27. Backstage Capital has invested more than $2M in 50+ companies led by underrepresented founders. Their review period for new founders opened on 2/15. Applications are accepted year-round. 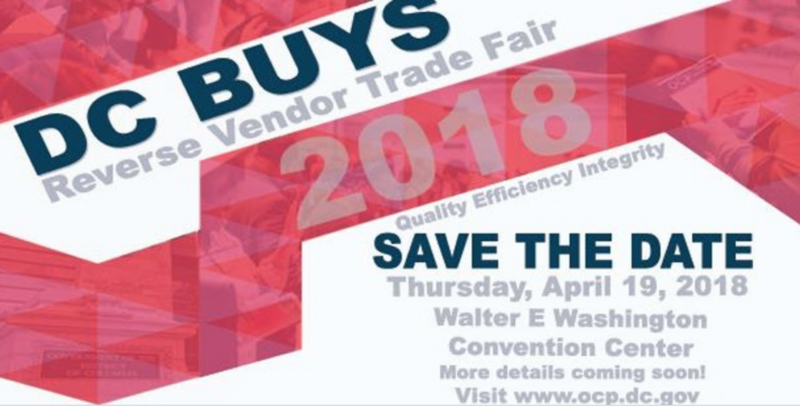 Are you an arts & crafts, food or dessert, direct sales or general vendor? Sign up with Chic Events/Empowered Women International for various opportunities around the District. 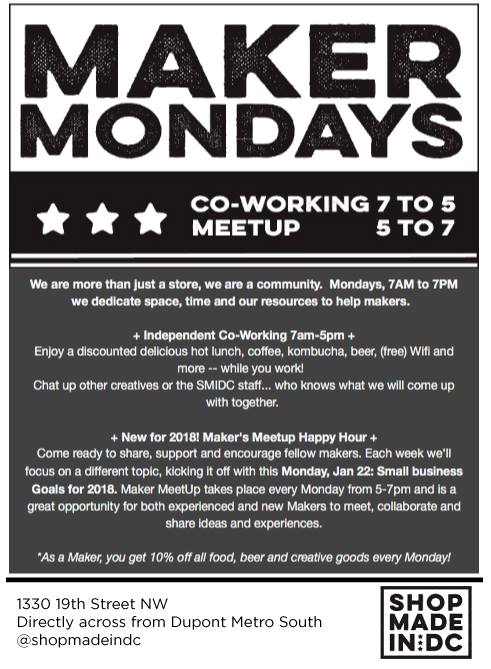 Ongoing: Every Monday is Maker Monday at SHOP MADE IN DC. Join us anytime between 7am and 7pm for 10% off all food, beverages and more. Independent coworking available from 7am-5pm. 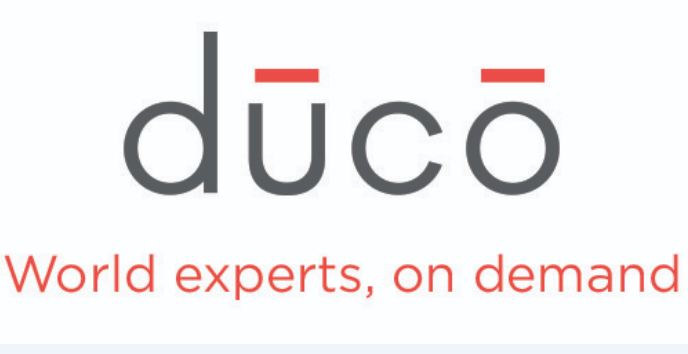 Dūcō is an on-demand platform where businesses connect with world-class experts to collect geopolitical and international business intelligence. Dūcō's experts are in 20 countries and are some of the most esteemed and trusted practitioners in their fields. 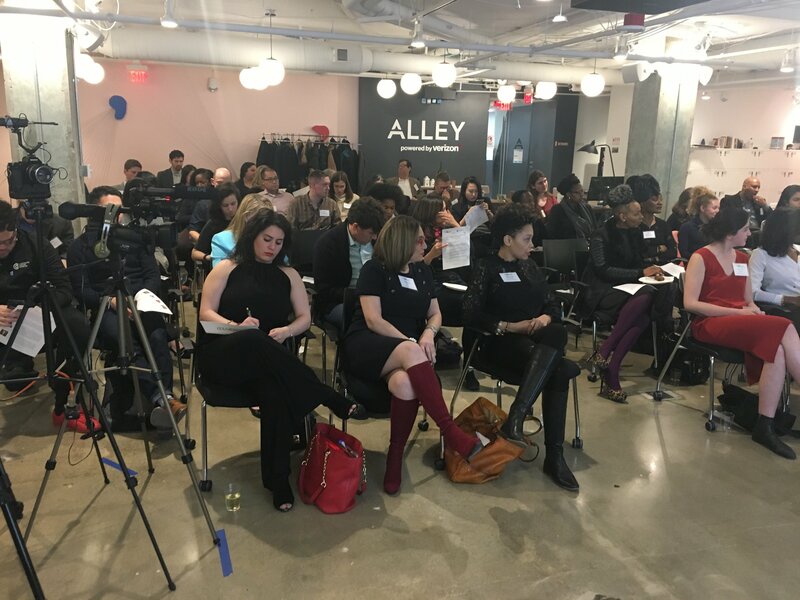 They include former high-ranking government and military officials, entrepreneurs, C-suite executives, and other thought leaders. Sidney Olinyk and Alicia Sloan are co-founders of Dūcō. Sidney's career spans national security, foreign policy, and leadership development - from the Pentagon to civil society to Washington's startup community. Alicia commands nearly ten years of national security experience advising policymakers through her work with the Intelligence Community, the DoD, and Capitol Hill. Learn more about Dūcō and its founders here. 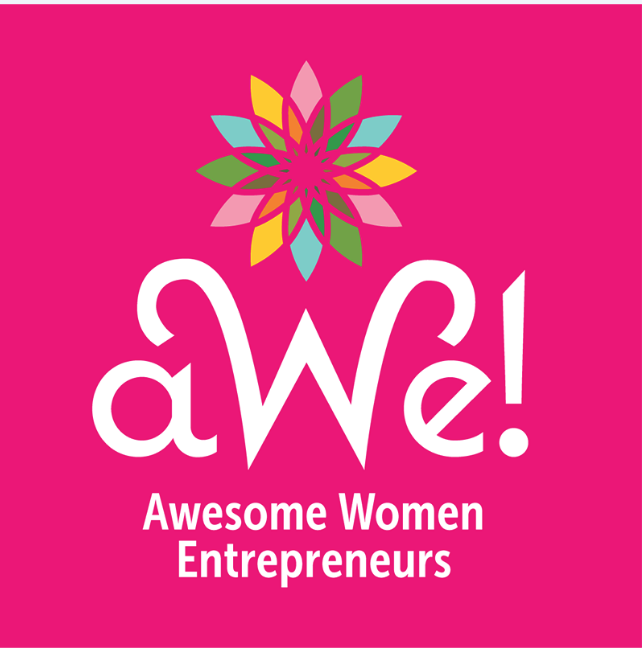 Awesome Women Entrepreneurs hosts intimate social gatherings for women entrepreneurs to share laughs, network and support one another. Be a guest on AWE Radio or reach the next level of success in small, six-month accountability groups. Join their community to hire, refer, collaborate and encourage one another: connect, inspire, laugh and grow with AWE! Are you interested in volunteering during D.C. Startup Week (Sep 24-28, 2018)? Various opportunities include mentors, day of event logistics, marketing, speaker, and core team roles. Learn more and apply today! Do you want to attend the Small Business Working Group Series during April's NCRC Conference? Scholarships are available to entrepreneurs who want to attend but cannot afford the cost. To apply contact Elizabeth at info@dcwbc.org. Help us celebrate D.C. Small Business Week! Are you planning a grand opening or customer appreciation day? Hosting a special training or other event? Submit your event here so that it can receive extra promotion!